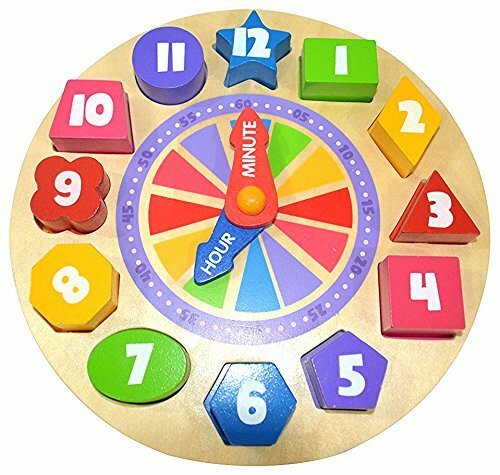 Wooden clock with 12 removable pieces for teaching time-telling and more. Fun Glow in the Dark feature -the number digits glow in the dark as shown in the picture. The hour and minute hands rotate which not only encourages realistic practice, but also making play time fun! Non-toxic paint, and child friendly, sturdy wooden construction. This interactive toy clock helps kids to learn basic concepts of time telling, further enhancing them fine motor skills, teaching them numbers, colors and shapes. Non-toxic paint, and child friendly, sturdy wooden construction. If you have any questions about this product by Pidoko Kids, contact us by completing and submitting the form below. If you are looking for a specif part number, please include it with your message.